KTMtwins.com KTM Motorcycle and Product News: KTM Super Duke and RC8 Levers that you never knew you needed! 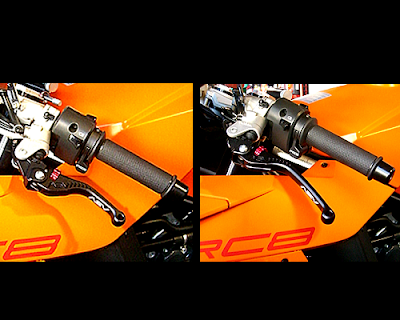 KTM Super Duke and RC8 Levers that you never knew you needed! Ever driven a car with a custom racing steering wheel? Remember what it was like the first time you fell in love with your favorite gloves? Ever wondered why you always see custom levers on all of your favorite race bikes at the starting line? Now you can know what it feels like. With enough adjustments to fit any hand and with the option of shorty or standard lengths you have no business riding without them. ASV will replace your lever in the event of crash for up to 5 years from purchase. It's an economic thing! Pick up ASV's Brake and Clutch Levers today before they are out of stock.